I LOVE THE FRUGAL TUESDAY TIP because I get to learn many new things. 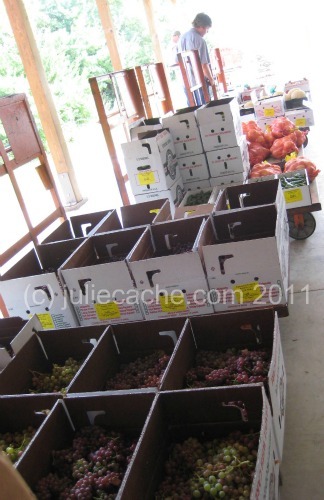 Jennifer, for example, linked up earlier this month and wrote about a produce auction. I had never heard of people doing this, so I headed to the internet immediately, along with fellow Frugal Tuesday Tip participants Kim and Sara. Here is what I recorded from my day. These are the medium sized lots. Grapes in the foreground, with 10 pound bags of onions, pecks and bushels of hot peppers, cantaloupes, lots of produce behind. Because all of the producers today were Amish (there are non-Amish producers as well, just not today), I was unable to record the full experience in photos. 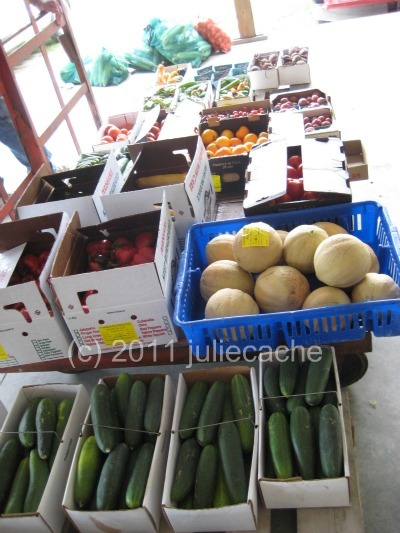 Small lots of produce are welcome and usually available. The owner didn’t want much camera presence because someone seeing it could be deterred from coming in the future. And we don’t want that. She said that “far away” shots would be OK, backs of heads would be OK, but I refrained. You don’t see the large lots here — they were horse-driven wagons, so no photos. Just imagine twenty bags with 4 dozen ears of corn in each bag. Or some large quantity of another vegetable or fruit like that. I think my eyes and ears got blurry once my brain calculated the total amount of corn, then shut off. Was the auction a worthwhile endeavor? I’ll write about that soon. I do have sounds recorded, I’ll get a tweet about out shortly. Follow me on Twitter @juliecache to find the video. This entry was posted in food, frugal family, photography and tagged amish, frugal tuesday tip, produce auction. Bookmark the permalink. 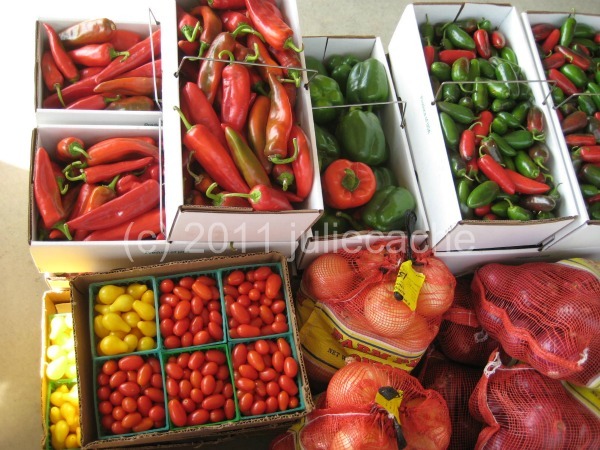 And if you think those peppers are pretty, you should have seen what my sister bought. The first of 2 articles is now up at Examiner.com (click the button in the right sidebar). It has details on the auction.